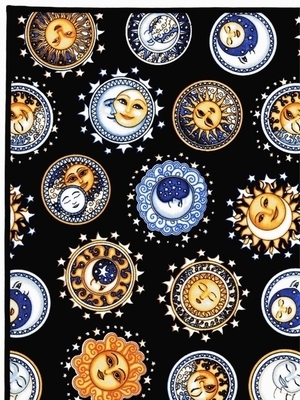 Bring a sense of hope, tap into dreams, and radiate joy with this Celestial Nights Reading Cloth. Orbs of smiling, friendly suns and dreamy, happy moons float against a black background. Featuring circular vignettes of our favorite heavenly bodies adorned with a ring of stars, this cloth depicts symbols of three Major Arcana cards: the Star, the Moon, the Sun. 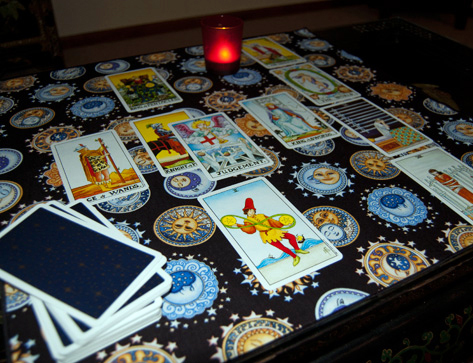 Deck Suggestions: The pop of colors in the Universal Rider-Waite tarot deck (shown with cloth) really stands out against this cloth. You'll really love how the Star, Moon, and Sun cards from the popular Radiant Rider-Waite Tarot are a perfect match. The Halloween Tarot, with its bright colors and clever style, is a good match, as is the Morgan Greer Tarot. Size: Measures approximately 21" by 21" (53.3 sq cm). Easily fits a Celtic Cross spread with most standard sized tarot cards (3" x 5").